It was the first week of the new school year, in the first scrimmage of the new season, and Hunter Salmon ’19 felt a pop. Just like before. Oh, not again, he thought, quickly hobbling to the sideline while trying to attract as little attention as possible from the one opposite. Sure enough, his initial reaction was mostly correct — he had reaggravated an injury on his left knee, one he had undergone surgery on the previous December. This was his first game back, and, already, he would have to miss more time. 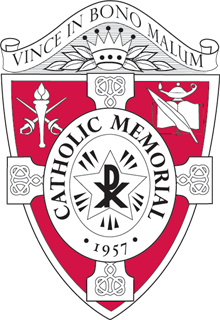 He had really been hoping that this season, his senior season at Catholic Memorial School, would be one where he didn’t have to deal with an injury. But he wasn’t completely correct. 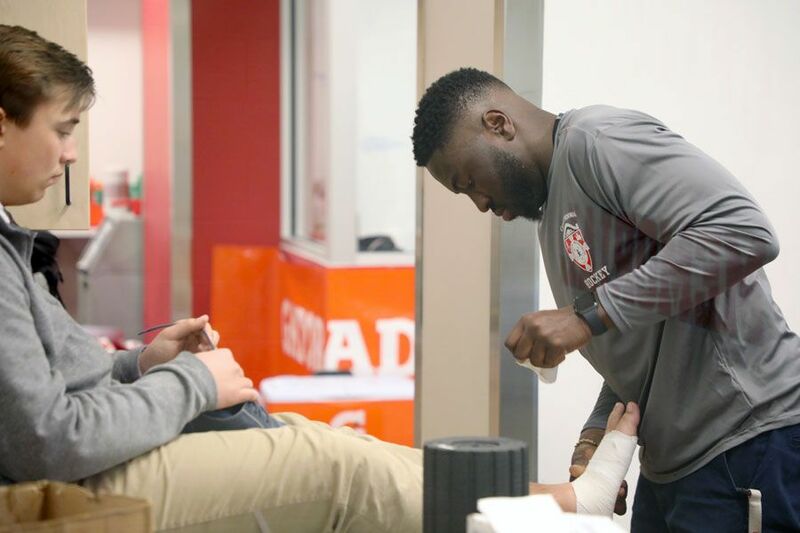 Hunter didn’t realize that CM’s new trainer — Mr. Jepthe Soulouque, who was already calming him down behind the bench — had the tools and a game plan to deal with a situation just like this. Hunter had met Mr. Soulouque before. Back in June of 2018, he had worked out with him a few times during summer practices. Hunter liked him, though he didn’t know the new trainer especially well by that first scrimmage. Then again, he didn’t need to know that Mr. Soulouque had earned a Bachelor of Science in Athletic Training from Norwich University, interned at Northeastern University as a strength and conditioning coach, and spent a year as an athletic trainer at Everett High School before following football coaches Mr. John DiBiaso and Mr. Michael Milo to CM. Mr. Soulouque’s experience, coupled with a plethora of advanced tools available in CM’s Health & Wellness Center, gave him all that he needed to help Hunter. Right after the game, he had Hunter go straight to an ice bath, bringing down the swelling that had been growing since the pop. He gave him an ultrasound to increase blood flow and reduce pain, as well as several other treatments. Hunter did just that. With good luck by his side, he felt rapid improvement over the coming days. He began to walk without pain, rejoined practice, and by the time the following week’s scrimmage came around, Hunter decided he was ready to go. Coach DiBiaso felt differently, and out of precaution, rested Hunter for another week. But when the first regular season game arrived, just two weeks after the pop, Hunter started at left tackle in a win against Saint John’s High School — the first of nine on the team’s way to making the MIAA Division 1 Super Bowl at Gillette Stadium. This is just one instance of the improvement Hunter has seen in CM athletics over the past two seasons — he came to CM as a junior in 2017. Six-year seniors graduating in this spring’s class have witnessed an even more remarkable evolution of the school’s supplementary facilities. It began with a relatively simple upgrade in 2015, when CM replaced the turf on the football field. In 2016, the revolving doors of the John A. Walsh ’61 Field House began to spin, opening up 12,000 square feet of indoor, heated practice space, complete with its own turf. The shining, white bubble almost instantly gave athletes at CM a protective shell against uncooperative New England weather. But it still wasn’t complete. The equipment from the old weight room, which has since been transformed into a crisp, new locker room, was hauled over for the time being. This wasn’t the long-term plan. When Mr. Craig Najarian took over as athletic director in the fall of 2015, one of his first tasks was deciding how to fill it. “There’s a million ideas on how to use that space,” Mr. Najarian said. Mr. Najarian came into CM with extensive experience at different schools around Greater Boston, including a combined eight years as athletic director at Holliston High School and Foxboro High School, as well as stints as a head baseball coach with College of the Holy Cross and assistant at Boston College. In strategizing renovation plans for a small, 12-acre school with mile-wide ambitions, Mr. Najarian turned to Boston’s professional baseball team for inspiration. To Mr. Najarian, that means relishing the existing character around CM’s campus, like the train that passes by the baseball field, and the iconic mural that backdrops the football field. But it also means leaving behind some old philosophies in exchange for more modern, innovative ways to make every inch of every facility as efficient as possible. An old-philosophy example: ensure your weight room contains plenty of treadmills, bikes, and other, often bulky weight machines. That wasn’t going to fly. Treadmills are largely one dimensional, serving as great tools for distance runners but few others. They also require wires and cords to operate, which can be easy to trip on, and aren’t necessarily easy to move. That all made them easy to leave out. Instead, today’s field house features inlaid platforms, preserving a wire-free space that keeps the area safe and clean. There are eight racks with bars where athletes can perform pull-ups and use TRX bands — all of which take up relatively little space. There’s a pair of cordless Airdyne bikes to help with injury recovery. There are rowing machines, giving athletes cardio training that will help their explosiveness on the field, the court, and the ice. The leftover space is open, giving teams plenty of room for group lifts. In short, all this technology minimizes the time athletes miss after an injury — sometimes cutting it in half or more, Mr. Soulouque says. It also allows him to be more efficient in working with the boys. A massage that may have taken 10 minutes or more before can now take him five minutes with one of his devices, meaning he’s then free to go help another kid who needs him. As the only trainer working with dozens of athletes at a given time, this is crucial. It also helps that he’s great at what he does. Mr. Soulouque has settled in and owns the wellness space. He takes advantage of a wall-to- -wall, floor-to-ceiling whiteboard covering the back of his corner office inside the center, writing up notes, exercise regimens, and team schedules. Coaches and athletes will come in and draw up plays, too. Of course, they do this not just for the board, but also to pick Mr. Soulouque’s sharp mind. His goal is the same as theirs — to help kids get out on the field and be their best. With Hunter, Mr. Soulouque didn’t just manage to get him back. He played every game, avoiding another pop, and surprisingly felt his healthiest at the end of the season. With the added lifts and preventive exercises from a new coaching and training staff, he didn’t even need his knee brace for the final couple of games. And while CM football fell just short of its ultimate goal this season, Hunter is sure the team will be back. It really helps to have the right men for the job.